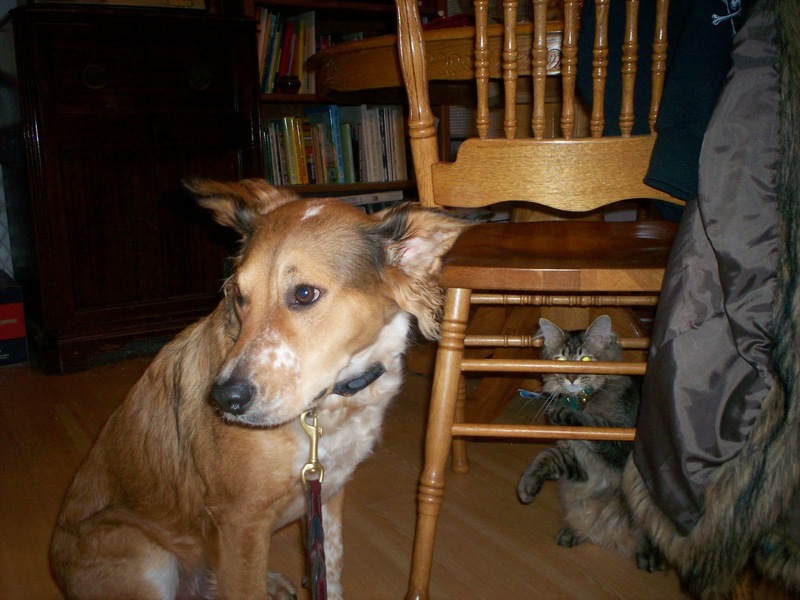 The Dog Geek: Leave the Cat Alone! Brisbane was raised with cats, and mostly ignored them until my brother brought home an adult cat that was listed as "dog aggressive" at the shelter. After several months of ambushing Brisbane from under the couch and dropping onto him from the tops of the bookshelves like a deranged koala, Misty got out at night and was eaten by coyotes. I like to think she started it. Brisbane and Tucker, one of his personal cats. My brother promptly returned to the shelter and picked out a slightly shy 4-month-old kitten. Upon returning home, Kat freaked out about Brisbane and he freaked out right back at her. 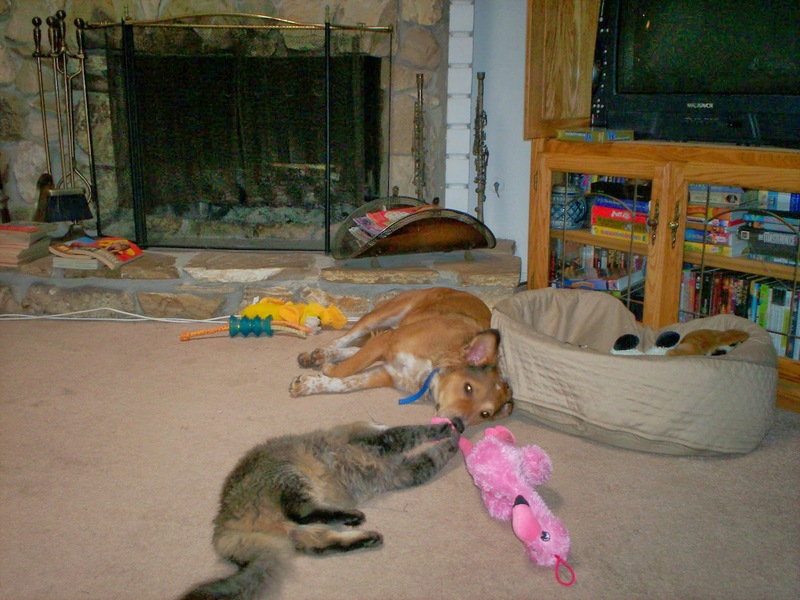 My kitty-loving puppy had become Cat Reactive. Brisbane's Personal Cats, the ones he had grown up with, were still perfectly fine. Cats that ignored him were also of little interest. Cats that hissed or growled, however, needed to be barked at ferociously. Aside from separating them, I needed to find a way to convince Brisbane that Kat was one of his Personal Cats. I needed to do it in a way that minimized stress on either party, and I needed to do it with zero cooperation from my brother, who felt that his cat should be able to roam the house freely at all times. With a lot of work I ultimately achieved this goal, and happily I have never had to repeat the process because "don't eat my new pet" became one of Brisbane's learned behaviors. With his ears back, looking deliberately away, with the whites of his eyes visible, Brisbane is stressed about being this close. Step 1: I needed to keep the two of them separate as much as possible. In the beginning this was easy, Kat wouldn't come near Brisbane so as long as he was on a leash everyone was safe. Whenever Briz and I moved around the house, I watched for Kat and gave her time to escape before we entered the room. When I couldn't be watching him, Brisbane stayed in his crate or behind a closed door. 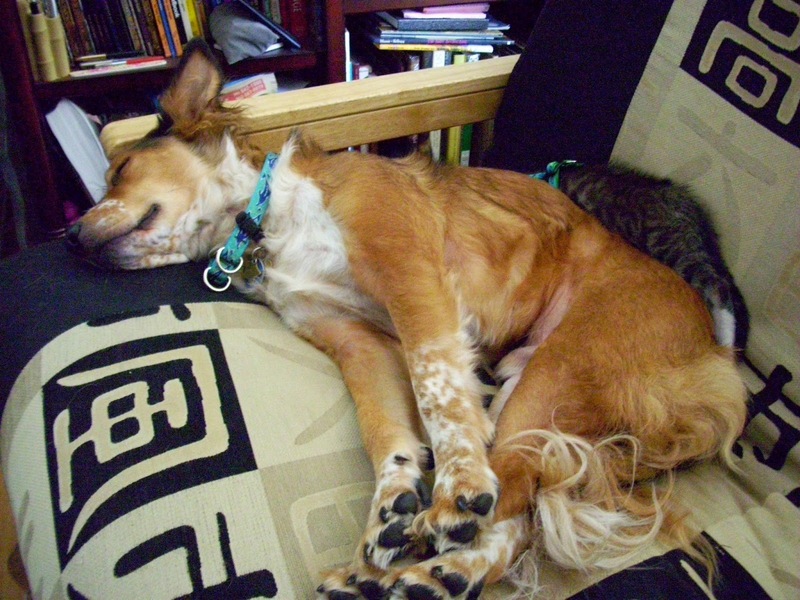 Sometimes I shut Kat in another part of the house so Brisbane could relax or play safely. Totally getting a cookie for putting up with this. Step 2: Whenever Brisbane saw Kat, he got plenty of treats. I tried to keep him far enough away that he didn't react, but this got harder as Kat realized she was not about to be messily devoured. For a while I used a Gentle Leader head halter so I could turn Brisbane's head away from the curious kitten and make him look at me. It's worth noting that Brisbane was never told 'no!' for barking or growling at Kat. I didn't want him to associate her with negative consequences. Instead I just kept stuffing treats in his mouth every time she was in view. Step 3: I continued reinforcing Brisbane for ignoring the kitten, and he got better and better at it. Even after he stopped barking or growling at her, he was visibly stressed when she was too close, as obvious in the picture above. Kat got bold enough to venture into biting range, and would rub herself against Briz while he tried his best not to have a meltdown. I knew we were going to be ok when I walked into the livingroom and found the kitten wrapped around Brisbane's leg, kicking furiously. He was standing perfectly still waiting for his reward. This entire process took around three months, after which I felt safe leaving Brisbne and Kat alone in the house together. This same method also worked well for introducing Briz to my husband's possessed zombie cat. Youma growls and hisses at everything that moves, not unlike Church from Pet Sematary. Brisbane was a bit stressed when we all moved in together, but he would pointedly ignore Youma while hoping for a treat. Years later I still routinely reward Brisbane for ignoring cat activity around the house, and for tolerating Youma's unholy noises. He very pointedly avoids looking at her, and I always give him a treat when I see that behavior. I also reward him for ignoring our other two cats, who were raised with Briz and occasionally enjoy being nibbled. I have also been able to trust Brisbane to not eat my turtles that live in the yard, and my birds that are often loose indoors. I wouldn't trust him unsupervised with the birds, but I do know that he can tolerate a clumsy cockatiel crash-landing on his sleeping head. There is never a point at which I expect to stop rewarding him for being good around other animals.